This picture does not have the snowcover that was there, but only shows my routes up the face of the bowl. The topo map below show the entire routes up from the Mt Baldy Rd. At the ridge this day the wind was gusting 30 to 50 mph, and at the top it was blowing 80+ mph from the North. Again, there was 2' ~ 4' of snow, but not as cold this day, and had to be careful to stay on top of snow. The glissade down the face was the high point of this day... it took less than 10 minutes to get back down. Took some pictures this day. These are both good crampon workouts up the face of the bowl. This hike/climb starts at the San Antonio Falls rd turnoff 6150' . Walk 2.6 miles to the Sierra Club Ski Hut 8200' . The climb up the bowl starts here... it is only .7 mi. to the top with a altitude gain 1964' from the Hut. 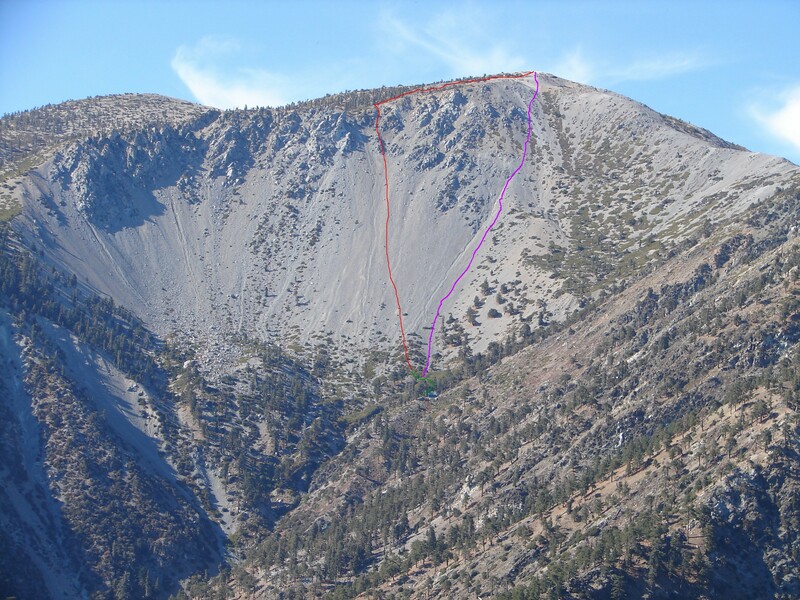 The face of the bowl itself is a 1600' climb, at about a 60% average grade, this is a 31º degree angle. Some calculated statistics are on map above. Bottom line... it is a lot of work and tons O' fun!